I love Harry Potter. Like seriously love Harry Potter. I rarely read a book more than once but I’ve read Harry Potter countless times. I also love Holly Black. I will pretty much read anything by Holly Black, even if it is a ripoff of Harry Potter. Three kids, two boys and a girl, going to a school of magic? Check. An orphan? Check. A dangerous forest full of dangerous creatures? Check. A Triwizard Tournament / Iron Trial? Check. Sneaking out at night? Check. A death eater type Lord Voldemort? Check. Despite all of this, I liked it. I’ve read other reviews where Black and Clare are criticized for their blasphemy against Harry Potter. No question, no doubt this is heavily based on Rowling’s work. A lot of the time I found myself guessing correctly where this book was going. However, it did have enough twists and turns. But the real thing that kept me reading was I felt Black and Clare didn’t bastardized Harry Potter. Heavily based on HP? Totally. Debased HP? No. All his life, Callum Hunt has been warned to stay away from magic by his father. If he is admitted to the Magisterium, he is sure it can only mean bad things for him. So he tries his best to do his worst and not get accept into the Magisterium. One small problem, he fails at failing. Call is thrust into a world and life he was taught to fear. However, once inside this new school, Call begins to question his father’s warning. But why would his dad lie? 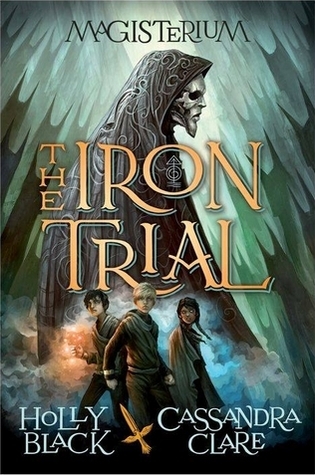 The Iron Trial by Holly Black and Cassandra Clare comes out tomorrow, September 9, 2014. This entry was posted in Children, Fantasy, Magic, Middle Grade and tagged Cassandra Clare, Holly Black, Magisterium, The Iron Trial. Bookmark the permalink.